To purchase the Hasegawa 1/32 scale P-47D Thunderbolt scale model manual on printed paper click this PAYPAL button. 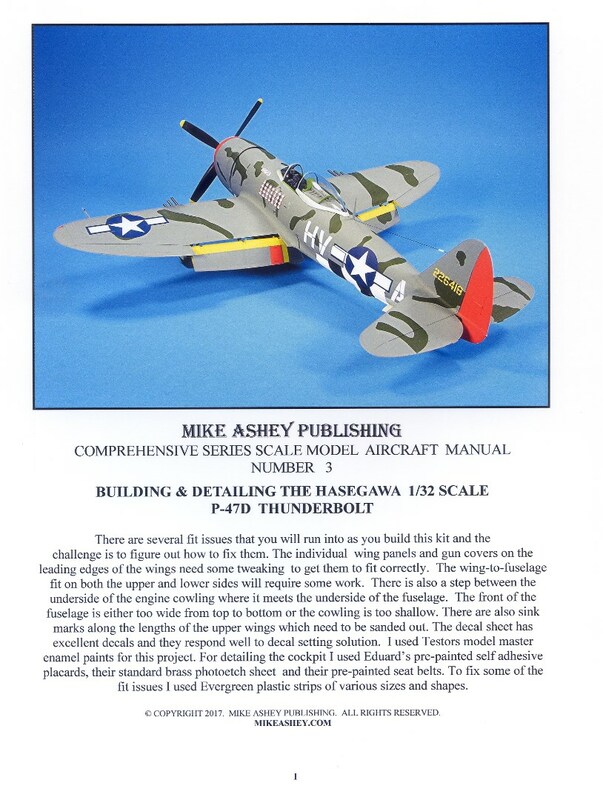 To purchase the Hasegawa 1/32 scale P-47D Thunderbolt scale model manual PDF click this PAYPAL button. This comprehensive series manual shows you how to assemble the kit in the proper sequence so that the fit and gap issues can be easily fixed. Eduard’s pre-painted, self-adhesive cockpit detail set is used and the manual provides step by step color sequenced photos showing you how to work with the self-adhesive parts. Photoetch parts are used in combination with kit supplied parts to greatly enhance the cockpit. The manual shows you how to modify kit parts for a better fit and use Evergreen plastic strips to fill gaps. Construction techniques to fix the step between the engine cowling and the fuselage and the gaps between the wings and the fuselage are shown in step by step sequenced color photos. The paint sequences provides tips on how to easily mask and paint invasion strips and how to cut out letters and numbers on large decals to eliminate any silvering.